About Agent Drain « Agent Drain Inc. Agent Drain Inc. was founded in 2005 by Shad Bruno in Alma, Colorado. The business was built on the principle belief of providing the highest quality sewer and drain service at the lowest price. We proudly serve the communities of Park County Colorado and Summit County Colorado in the beautiful Rocky Mountains. We are pleased to say that we have grown and expanded each year that Agent Drain has been doing business. We believe our reliability, customer service, and experience is the key to that success. This allows us to offer more to the customer while maintaining high quality. We now have two vans each equipped with our specialized tools to help provide faster response times and to eliminate any down time. We have also recently acquired a Ridgid Video Camera to add a visual inspection capability to our bag of tools. A customer can now view the video inspection report online and we can also provide our clients with a flash drive with the video inspection report for viewing at their convenience. We never forget that customer service is our primary focus. 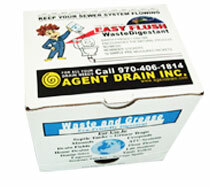 We will be here for your sewer emergency when you need us most!